Driving mostly on sunshine is very fuel efficient! We are just home from spending the Easter Long-Weekend in Canberra at the National Folk Festival. 5 Days of great music, camping out under the stars, catching up with old friends and drinking some very nice pear cider. We drove down and back in our new plug-in, Electric car. 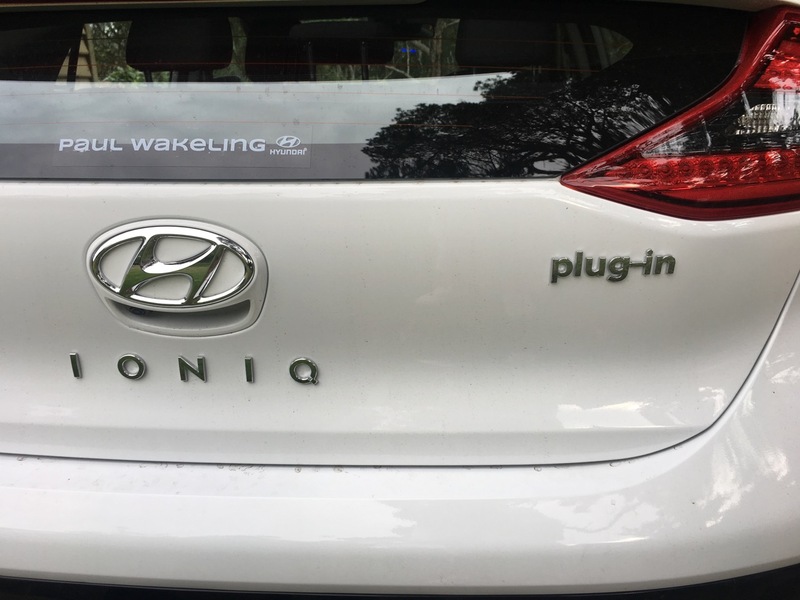 The Hyundai Ioniq plug-in. Canberra is roughly 200 kms. away, so we drove the first 1/4 or so on sunshine and the rest on petrol. We get around 65 to 70 kms on a full charge of sunshine from our solar panels at home. This distance varies slightly, depending on how hard you push the car (I don’t ) and how much regenerative braking that you do, as regenerative braking re-charges the battery from the energy recovered from the braking system. Instead of applying pressure on the brake shoes in the wheel hubs to slow the car. Regenerative braking engages the electric motor and uses it in reverse, so instead of using electrical energy to propel the car forward. The forward energy of the car is used to run the generator to charge the battery and this drag on the system slows the car. The disc brakes are only engaged when you press very hard on the brake pedal, such as in an emergency. The car automatically swaps over to petrol when the battery charge gets very low, always preserving just a little battery power in reserve for when the car is just cruising and doesn’t need a lot of oomph to get along. Braking, when going down hill, recharges the battery, so the car is intermittently changing between electric mode from the battery and the internal combustion engine all the way along the trip. Before setting of for home, I check the dash to see that we have a driving range of 111 kms, but home is 200 kms away, so I decide to buy some fuel. We have travelled 3,788 km in this car since new and we have put $50 in the tank so far. I can see that we still have 8% left in the fuel tank. We fill up in Canberra before the long drive home and put in 36.95 litres into the tank, at $1.45 per litre. On the way home Janine calculates that we have travelled 2,138 km on our first $50 tank full of fuel. So this seems to indicate that we are averaging about 1.7 litres per 100km. It crossed my mind when I bought this car that I would be able to achieve a bit better than 2,000 km on a full tank of petrol, and so it seems that we have done it. We arrive home via the shops in Mittagong and are just short of 4,000 km on the odometer. The first thing that I do when I get home is plug it into the solar PV system and re-charge the battery fully, ready for the next trip. When we are driving locally, we mostly drive on 100% sunshine. The battery is sufficient to get us to the shops and back in any direction that we need to go. We only use petrol when we go on long trips like this one to Canberra, or to Sydney, the South Coast or The Blue Mountains. At the end of each trip, when I switch off the ignition. a small window in the instrument panel reports on the latest trip. This trip was 33 kms and I used 0.6 litres per 100 kms. Which means about 200mls. I’m not entirely sure as yet why the petrol engine fires up at unexpected times, even though I have chosen fully electric mode. I believe that it is something to do with charging up the 12 volt battery, that is used to power the dash, computer, air-con, head lights and other things that don’t involve moving the car forward. We have achieved these very fuel-efficient figures in our driving, because we always drive steadily, and evenly, avoiding sudden stops and fast take-offs. The on-board computer tells me that we are averaging 390.64 kilometres per litre of fuel. This is because we usually drive mostly on sunshine. The info below is down-loaded to my phone on the 1st of each month. This report is for March and doesn’t include the Canberra trip. It is a very rewarding feeling to be able to drive mostly on sunshine. It fits in with our philosophy very well. This isn’t about saving money on fuel. This is all about attempting to live an ethical life with a low-carbon foot-print. Extracting our selves from the coal/oil based carbon economy as much as possible. It started 30 years ago when we stopped driving our old, but reliable VW beetle and bought a small, 3-cylinder 900 CC. engined, fuel-efficient Daihatsu car, slashing our fuel consumption, and then 12 years ago when we installed our first solar panels. Two years ago, ordering the Tesla battery when it became available in Australia. Now we are driving on sunshine – well mostly! I have relatives coming to stay and I really like them. We don’t see them often enough. So to celebrate their stay with us. I try and make an effort. Something different for change! My niece is of Italian heritage and so I choose to make my bastardised version of Cannoli de Sicillianna. It sounds impressive, but I don’t have any of the ingredients. 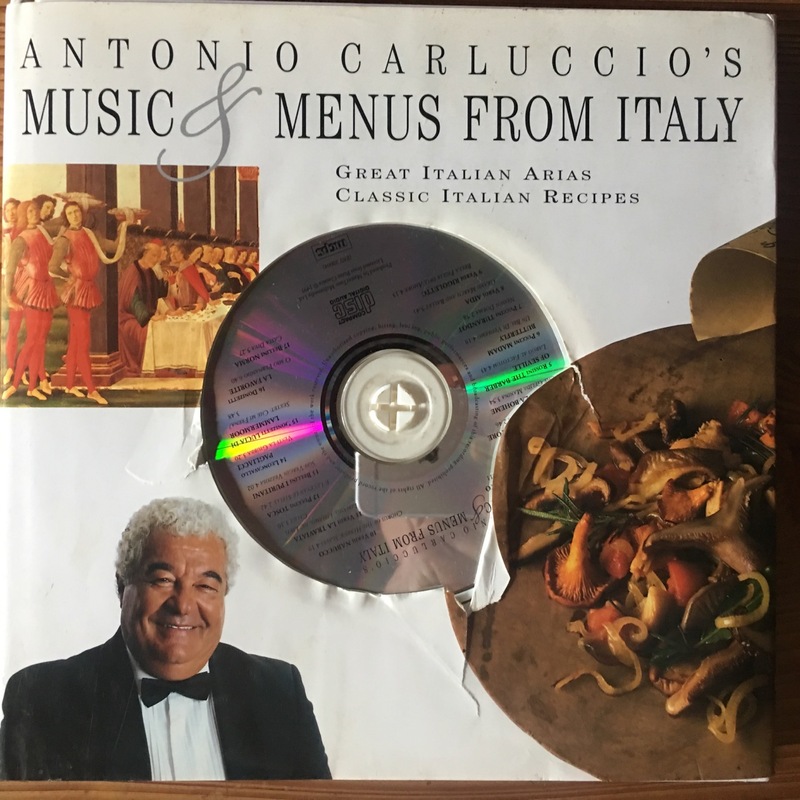 The recipe that I use comes from a book about opera by Antonio Carluccio. It is all about foods that are suitable accompaniment for opera. I remember seeing Rick Stein on the idiot box doing a special on food and opera. I didn’t get it. I thought that he was stretching a long bow. Anyway, I saw this book by Carluccio in a 2nd hand book shop, maybe 20 years ago and bought it. It has a recipe for cannoli (P76), but I can’t bring myself to follow it. Apart from the need the make the tubes from scratch and deep fry them in lard! 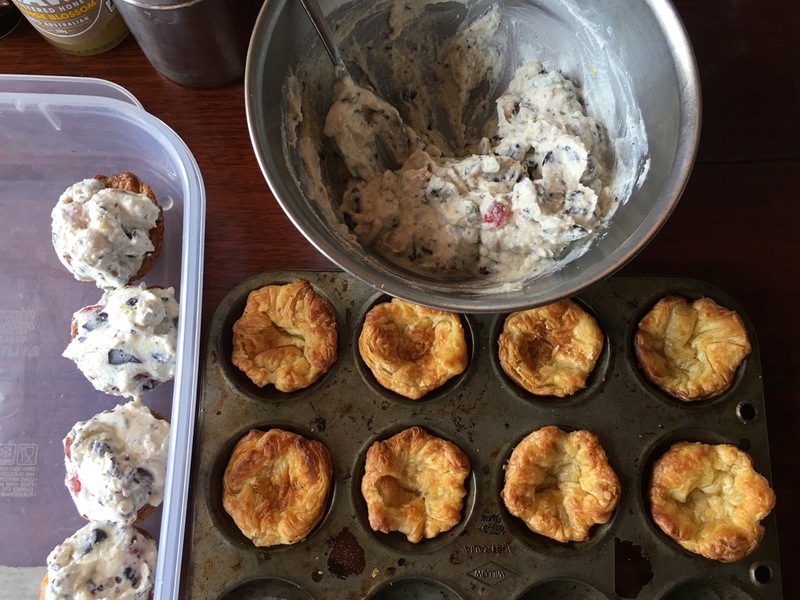 I don’t even have any of the ingredients except the ricotta. I can buy ricotta at the local shop, only a 10 km trip, but have to drive the 50km into town and back to buy the glace cherries at the supermarket. All the other ingredients look pretty exotic. You get used to living in the country and making do, so I improvise. I am only making one dozen of these little cakes, so I halve the quantities. 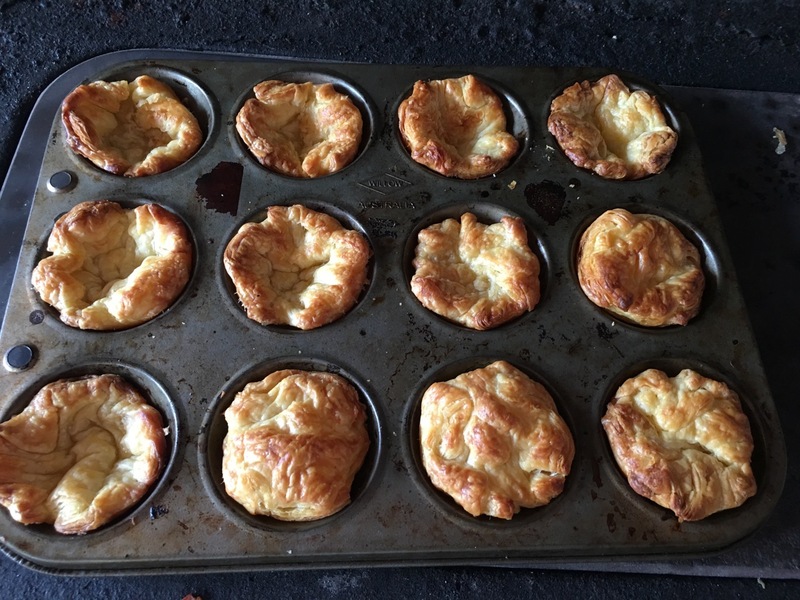 I’m not into deep frying in lard, so instead I make some little tartlet bases and blind bake them for 15 mins. 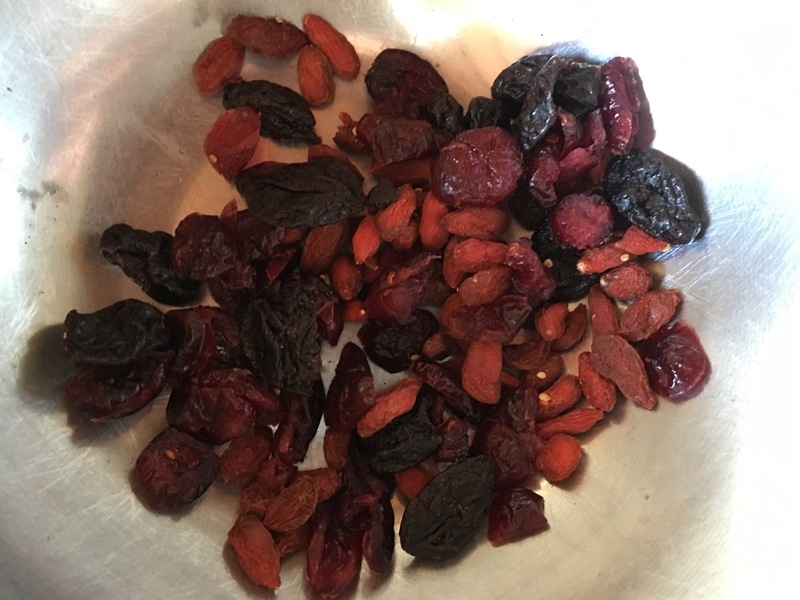 I use the few dried fruits that I have in the big stoneware jar in the kitchen for making our muesli. 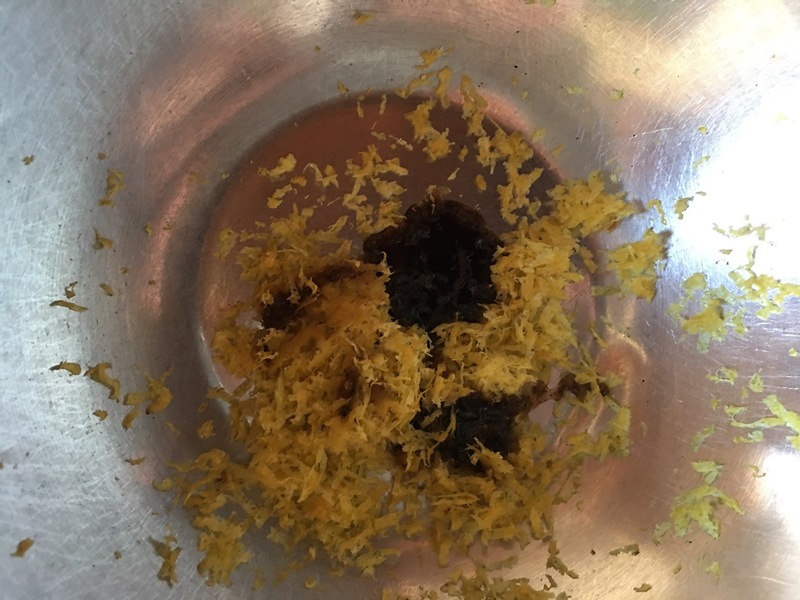 Then instead of orange flower water, I decide to use finely grated lemon and lime zest, plus the juice of half the lime. Janine has some vanilla paste in her cooking cupboard. Instead of all the exotic candied fruits, I use my dried fruits muesli mix and instead of bittersweet dark chocolate I substitute half a dozen tiny ‘Aldi’ dark chocolate easter eggs finely sliced. After all, it is Easter. It actually works out really well. 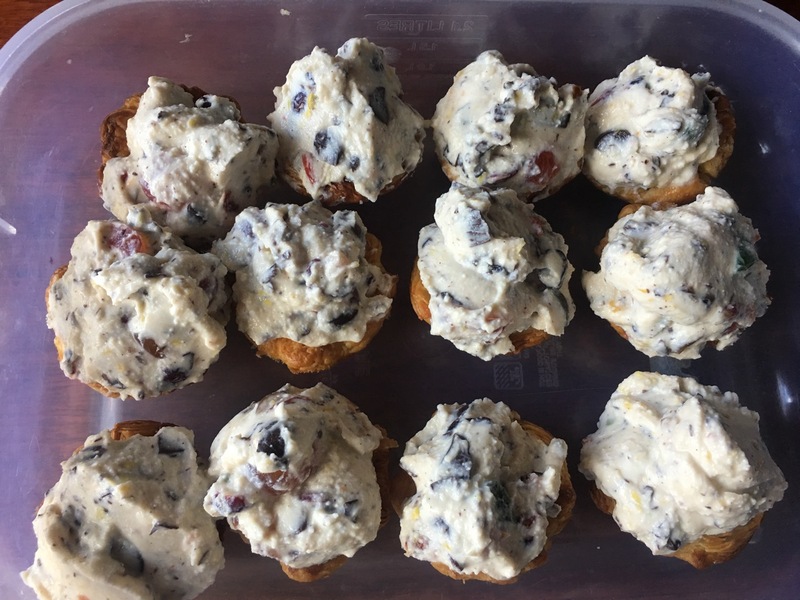 They look rough but they taste delicious. Funnily, they didn’t turn out like the picture in the book! 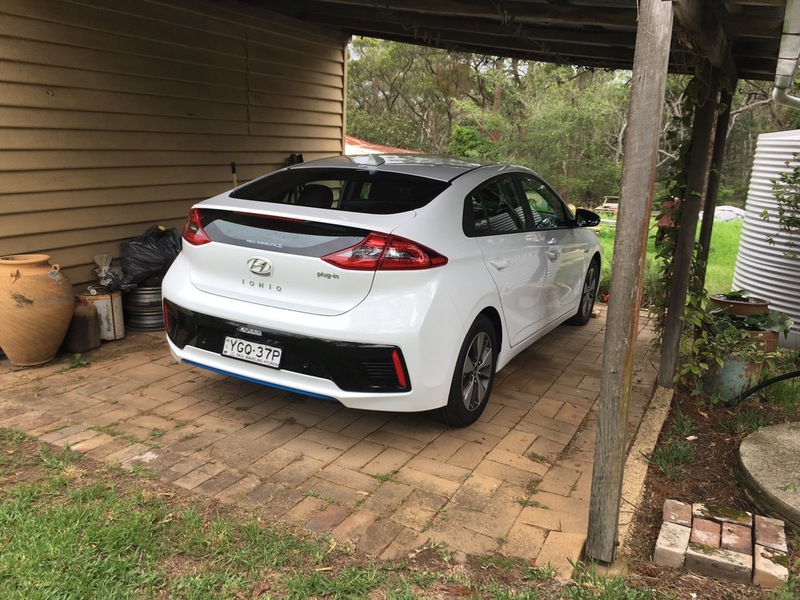 I’ve had the new Hyundai Ioniq PHEV Plug-in hybrid electric car for just over a week now. So I can give a better account of what it is like to drive and own. As with most modern cars, it has a heap of complex software options in the inbuilt computer which is capable of doing more things that I care to learn about in the short-term. A bit like my phone or my laptop, it can do much more than I will ever ask it too. It will take me a little more time to work through all the options and internalise them to a point that they are at my finger tips and therefore useful to me. At the current time most of it is still opaque to me, so I don’t attempt to use stuff that I don’t see any need for. Especially if it distracts me from my driving, I don’t go there. I am not a petrol head, so I don’t know anything about cars. I’ve always bought the cheapest, fuel-efficient car that I could afford. That was nearly always a 3 cylinder, 1 litre engine car. We had a Daihatsu Charade and then a Daihatsu Sirion. We had them for about 10 years each and about 250,000 kms. Being one of the cheapest cars on the road, they came with manual everything, totally no-frills driving. I really enjoyed driving a small manual car. That is what I’m used to. So the hardest thing to get used to in this new car is not the technology or the electric propulsion, but the fact that it is an automatic! I’ve never driven an automatic car before. I still feel the need to lift my left foot to de-clutch as I approach a stop sign! The car has 3 modes of travel. Fully electric directly off the battery, Hybrid electric where it starts off in Electric mode and sometimes switches to petrol mode if you put your foot down. and then ‘Sports’ mode, which seems to engage both motors at once. This mode is pretty zippy – I’m impressed! Changing between these modes is done electronically with the press of a button. I have spent the first week mostly driving in ‘eco’ mode in fully electric selection, because this is why I chose this car. I have lots of solar PV on my roof and a Tesla battery at home, so I’m completely ready for fully solar electric living and travel. I have found that I can do all my local driving on the battery in eco electric mode. Recharging is done using a bog standard 10 amp 3-pin household power point and takes 4 hrs if the battery is almost fully depleted. Because I’m not a pushy or aggressive driver, driving as I normally do and am used to doing around here, the car stays in ‘eco’ fully electric mode 99% of the time. Just occasionally when I come to a steep hill and put my foot a little harder on the accelerator, the petrol engine cuts in when I’m in Hybrid mode and I can feel the surge of extra power propel the car forward. Because the car is electric (most of the time), there is no engine noise or vibration when you pull up at the lights. The car pulls away smoothly and silently from the lights. If it is in hybrid mode the engine cuts in after a hundred meters or so, or if/when you get up to 20 kms/hr or so. This is totally seamless and the only way that I know that it has happened is the little icon on the dash that changes from electric to hybrid. Most of the time it is just steady as she goes, totally silent, comfortably plush and comfy driving. The most noise that I hear is the tyre noise on the bitumen, I’ve become quite aware of the differences in road surface and the various noises that they each create. Visibility is very good with the mirrors. I really dislike cars that have tiny back windows. 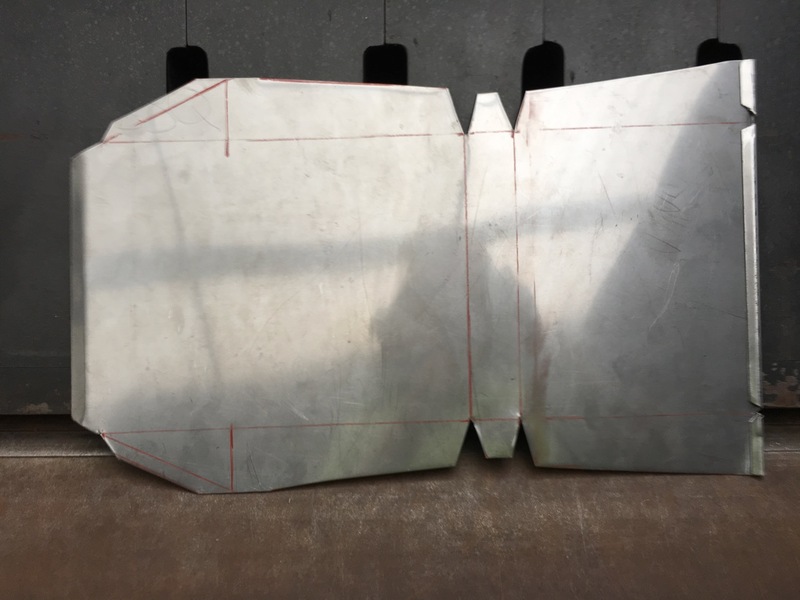 The back hatch on this car has a metal bar across it as part of the design to strengthen the huge flowing lines of the sculptured, mostly glass hatch. but visibility is still very good. I’m used to driving with the 5 point visibility habit and this design works perfectly well for me. However, I can see that I will eventually start to loose this habit, as I become more accustomed to the reversing camera and the active side mirrors. Even though this car is the base model it has a few bells and whistles. Like side mirrors that have an alarm built-in that beeps and flashes to let you know another car is very close on that side if you put your blinker on to change lanes. It makes a humming sound that is generated when driving slowly in pedestrian zones like shopping centre car parks, so that people car hear you approaching from behind. It has adaptive cruse control, so that if you are cruising along and another car pulls into your lane in front of you, this car automatically senses that car and slows down to the same speed as the car in front, keeping several car lengths distance. The car also beeps if you cross a marked lane without indication. When reversing, it beeps if there is a car coming from either side that you can’t see, as you attempt to reverse out of your parking spot. The media player/radio also cuts the volume to half when you put the car into reverse, so that you become more aware of your outside surroundings as you reverse. All these little gadgets are very common in all new cars these days I expect, But our last car purchase was 13 years ago and it was the very basic poverty model. So this is all new to me. The car has an automatic, 6 speed, dual clutch, gear box, so that either motor can operate independently, but also at the same time in unison, when you choose to. It is powered by an Atkinson cycle 4 cylinder, 1.6 litre petrol engine, as well as the electric motor. Although it is still a small car hatch back, it is also the biggest car that I have owned. The Atkinson Cycle motor is a very interesting design and is particularly fuel-efficient. Try searching for it on the Wiki. To get the best fuel efficiency out of the car, many of the panels are made of aluminium and the rest of the body is made from super high strength, hot pressed, high tensile steel making it lighter, yet stronger. This saving in chassis weight is taken up by the battery. In stead of using the brakes, the car uses standard regenerative braking that is basic to all hybrid cars. An idea that has been around since the 50’s. Over-all there are a lot of little efficiencies all combined together to make this an impressive piece of engineering. Of course, most of these ideas are not new. The Toyota Prius has been around for 20+ years, but it can’t drive on sunshine, it is strictly a petrol powered car. Many of the initial concepts of both electric and hybrid cars were introduced to me by Meredith Thring in 1980 when I read his book. Professor M W Thring pioneered many of these innovations in Yorkshire at the University of Sheffield and later at Queen Mary College, at the University of London in the post war period. See regenerative braking above. I bought the book that he wrote after he retired in 1980, called ‘The Engineers Conscience’. Interestingly, he was an Australian who moved to the UK to work, so maybe we can lay some marginal claim to the intellectual property invested in this car. I can safely claim to have been intellectually engaged in watching the long, slow development of these cars since the 80’s. I have driven 500 km so far and the fuel tank is still completely full, the indicator hasn’t left the full mark yet. I must say that it is a very rewarding feeling to be able to drive totally on sunshine. I know that this will annoy some people, but the development of cars like this has been in the back of my mind since 1980 and has now become manifest in the availability of this car in Australia now. I have to say that it is so important to me and very rewarding to be able to drive for the rest of my life on the sunshine that I collect off my own roof. I’ve been telling people that 2019 is going to be the year of the electric car. Yes, I’ve said it before, just a week or so ago. Well, It really is now. We have just taken delivery of our electric car. It’s a beauty, totally silent running. It’s quite a wonderful experience to behold a powerful, yet simple, quiet and elegant car perform so well. And mostly running on sunshine too! Why has it taken so long for this type of car to become available in Australia? Our new electric car is a Hyundai Ioniq, plug-in electric car. We ordered it a few weeks ago. The first to be delivered here in Australia, or so I’m told by the dealer. We had to order it and wait for it to be built in Korea, then shipped to Australia. The local dealership system doesn’t carry the ‘basic’ model in stock, only the premium model. This car has been available in Korea and other countries like New Zealand for 2 years. Why so long to get to Australia? The Hyundai Ioniq electric car is available in 3 models. Fully electric, Normal hybrid (like a Toyota Prius), and a plug-in hybrid. After considerable research, we decided to choose the plug-in hybrid model. A fully electric car has a limited range of 230 kms. Not enough for us to live here out in the country and travel to Sydney and back for the day. Maybe in another few years there will be more recharge stations and better batteries? As it stands, we would need to own two cars, a petrol car and an electric one. 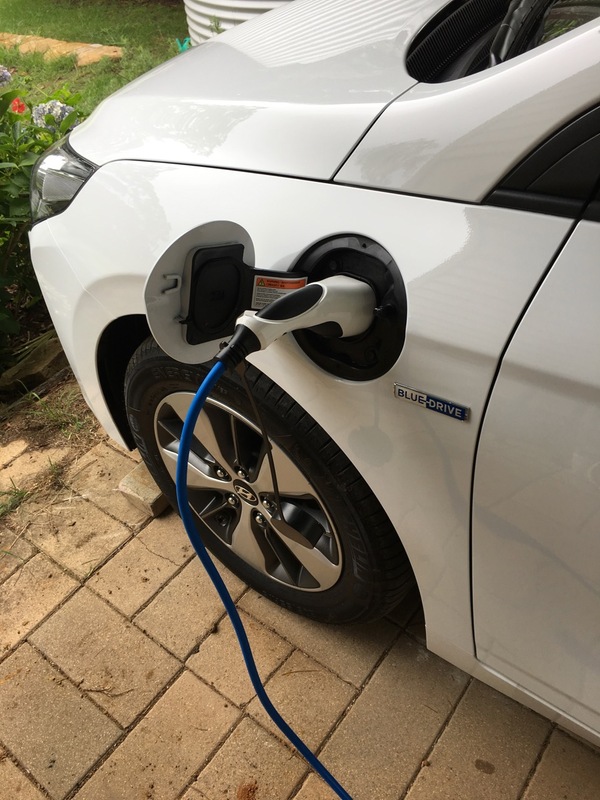 For this reason we chose the plug-in electric hybrid, because we can do 95% of our trips on fully electric, battery-powered, solar generated electricity. But also be able to drive longer distances on petrol power when we need to go the long distances occasionally. Like our once a year trip to Canberra or up the North coast. It’s a very modest car. Nothing showy. I have only owned it for one day so far, so very early days. The company claims 63 kms of fully electric power with ‘normal’ driving and 1000 more on a full tank of petrol. The blurb claims something like 110 kms per litre of fuel. I drove it around and reduced the battery down to 20%, where the petrol engine started to cut in occasionally, acting like a hybrid does. I plugged it into the standard 3-pin, 10 amp power point at home and it recharged itself in 3 and a bit hours using the built-in charger. Fully recharged on solar power. The onboard computer keeps a track of how you drive. I have always driven carefully and steadily to conserve petrol in all my previous cars. Which have always been very small, fuel-efficient cars. Mostly 3 cylinder, 1 litre cars. This is the biggest car that we have ever owned, but it is still classed as a small car. A 5 seater 1.6 litre hatch-back. After charging the battery the computer tells me the distance I can travel on the battery and even shows me on the built-in sat nav screen, the radius of the places I can reach on the map + where all the nearest charging stations are. We live 25 ks from the nearest towns where we do our shopping and banking, where we have all our accounts etc. So I expect that I can do 100% of our local trips on solar power in future. So the first day has gone very well. The car does everything that I expected, It comes with an 8 year warranty on the battery and mechanical parts. I look forward to only visiting the fuel pump a few times a year in future. It’s a nice feeling to look forward to driving mostly on sunshine for the rest of my life. 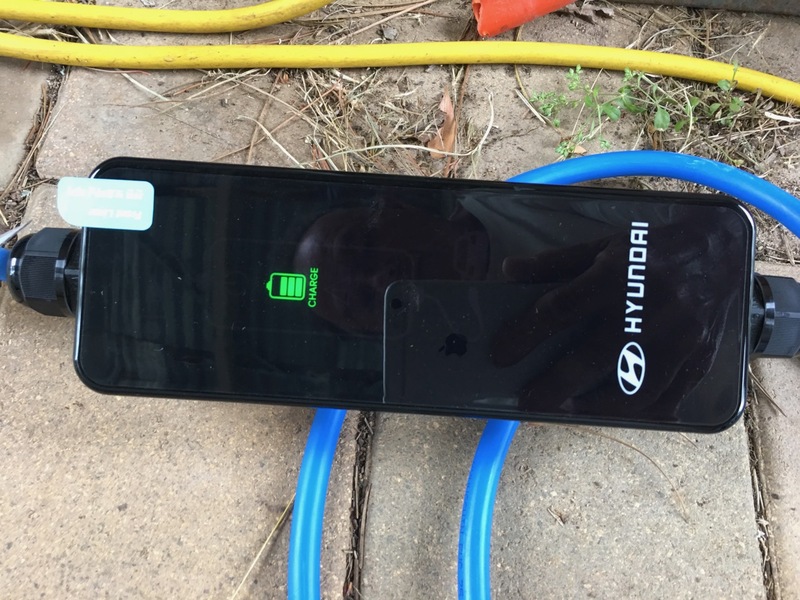 Because we already own a Tesla Powerwall II battery, we can always recharge the car on stored sunshine, even on dull over cast days. Note to self, don’t buy plastic crap – again! 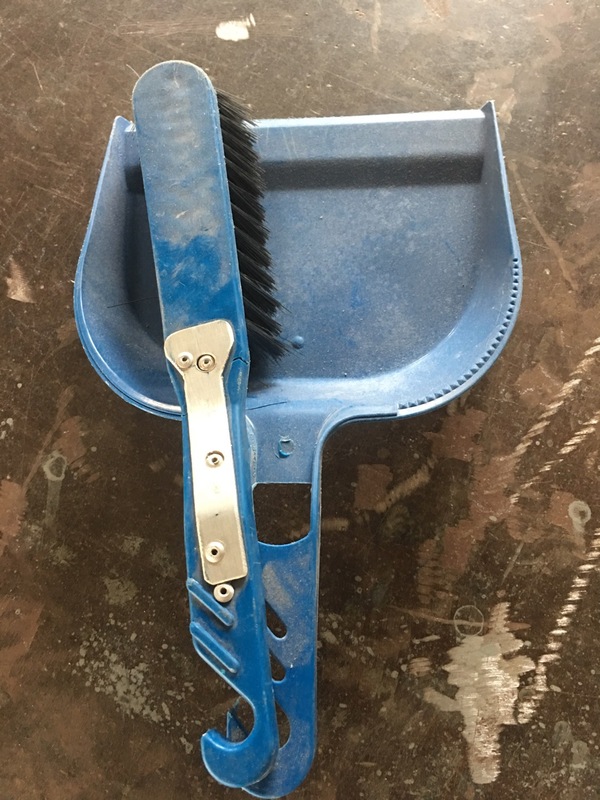 I wanted a simple dust pan and hand broom to clean up in the workshop. The only choice in the shop was between 2 similar styled plastic ones. 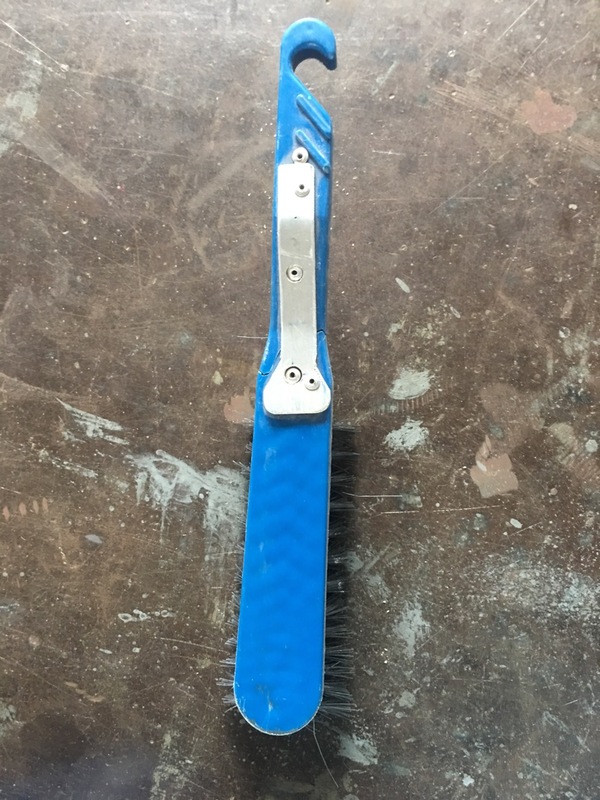 What happened to wooden handled hand brooms with stiff bristles? And metal dust pans! Long gone in the race to the bottom of quality and price. Couldn’t someone at least produce something of quality that would last? I hate having no choice but to have to buy plastic junk. this is just land fill in waiting. Well, as there was no choice I had to choose a plastic one and lo-n-behold, what happened, but the handle broke in two in the first few weeks. I refuse to be so insulted with such blatant built-in obsolescence, so I determined to fix things. 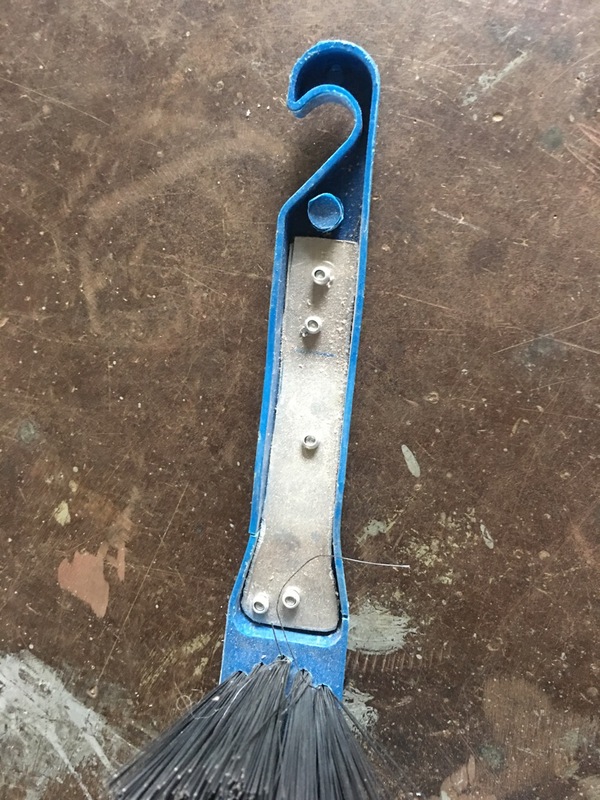 I made a pair of reinforcing brackets out of some scrap pieces of aluminium and bent them to fit snugly into and onto both sides of the broken handle, then pop riveted them into place. This is still a piece of plastic crap, but at least I have fore-stalled its trip to land fill for a while. I still want to buy a wooden handled, natural bristled, long-lasting broom. I’ll have to look harder. This impromptu repair won’t stop the rest of the plastic from collapsing in time.. Maybe I can dismantle it and reuse the bristles? 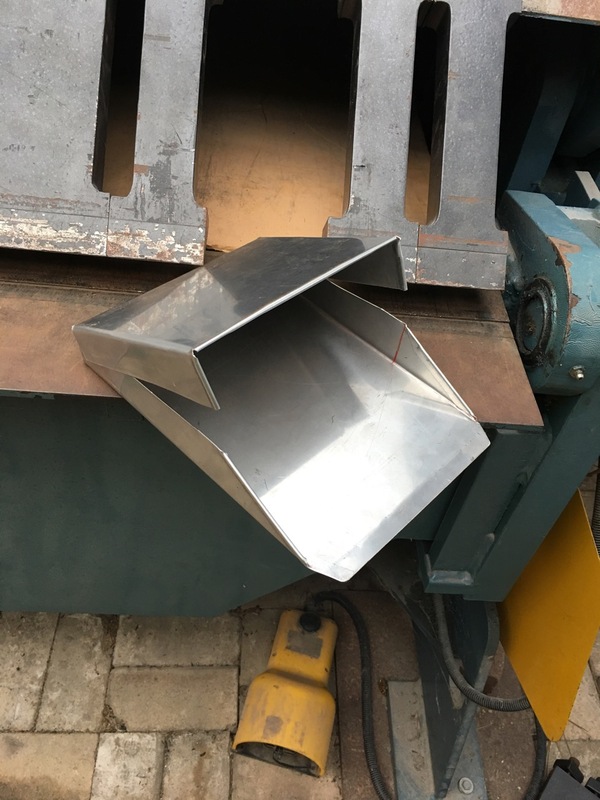 The old dust pan too is on its last legs. At least this one has seen a bit of use to justify its existence. 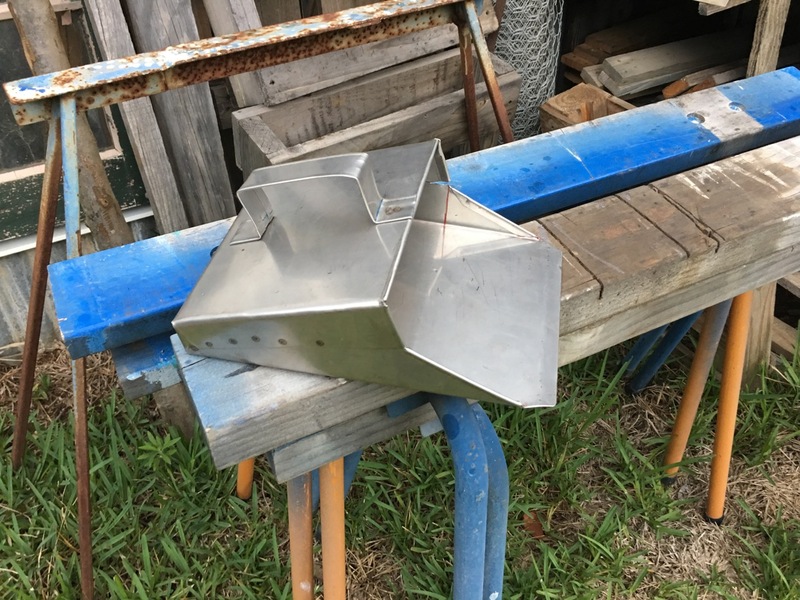 I decided to make a dust pan that will last couple of hundred years out of a piece of Stainless steel scrap. The off-cut is a bit smaller than I would have liked, but I use what I have. It all sort-of goes to plan. It’s a bit narrow. The next one will be better. This is my first attempt after all. When I get a bigger piece of off-cut, I’ll make a wider one. I’ve been telling people that 2019 is going to be the year of the electric car. I have just taken delivery of my first electric car. We took delivery on Friday. It’s a beauty, totally silent running. It’s quite a wonderful experience to behold a powerful, yet simple, quiet and elegant car perform so well. And running on sunshine too! No petrol tank to fill. Why has it taken so long for the powers that be to get on board. I’m a very proud owner. All they need to do now is to scale it up. As part of my long-term ambition to live a life as self-reliant as possible, I am continually trying new things that might help achieve that aim. We have built our own house from scratch, making our own windows, french doors, roof trusses and floor boards. We bought and demolished the old Mittagong Railway station, then cleaned all the old sandstock bricks to use to build our house. I even excavated the sand stone footings and carved them into the new window sills for the house. Over the years, we grew trees here, then felled them to make all the kitchen furniture, chairs and tables. If you have been reading this blog for any period of time, you will know that we make all our own clay bodies and glazes from stones that we collect locally and then crush and grind them to make all the various mixtures that we use in the pottery. I try not to buy anything that I could do myself. This frugal life style of self-reliance and simplicity has worked out quite well for us. I even had a go at building my own aluminium truck body. It didn’t turn out to be that hard. 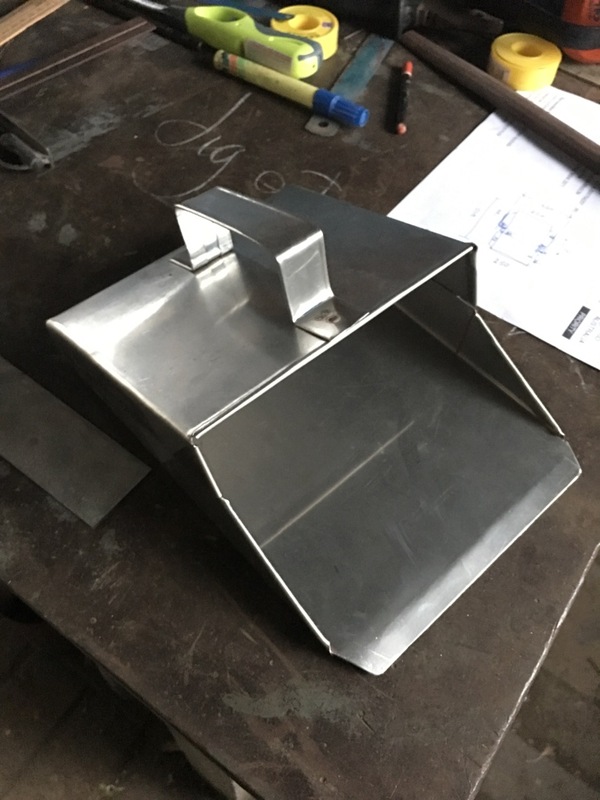 I welded it together from all the left over off-cuts from building electric kilns. It was a most rewarding well-spent week. So this last few weeks leading up to the summer holiday gap between Xmas and New Year, I decided to have a go at making some kitchen knives. I have quite a few worn out or broken hack law blades from my mechanical power hack saw. These blades are made from excellent quality high Speed steel. This steel is quite exotic, being an iron based carbon steel alloy composed of varying degrees of tungsten, vanadium, cobalt and molybdenum. It is extremely hard and long wearing. This stuff has such a high degree of embedded energy that I couldn’t bring myself to throw them out after they were worn out and blunt. I have worn my way through quite a few of these large 350mm blades over the past 40 years. Now I have made use of them. I hate to put anything in the recycling bin until it is really, truly worn out, or broken beyond repair. I have spent a couple of hours each day working on them, whenever I got bored with what I was supposed to be doing. 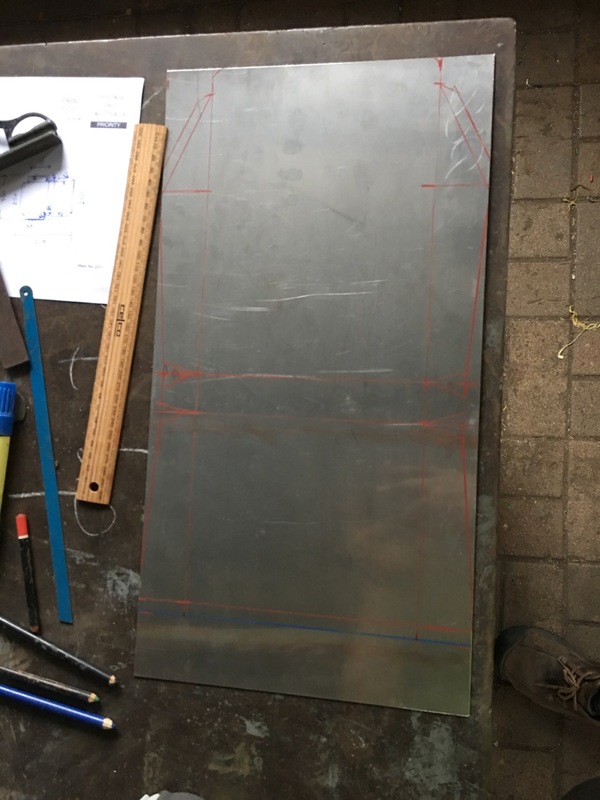 I cut out and profiled the blades using the angle grinder, ground them to a taper on the bench grinder and this can take at least an hour, if not more, depending on the size. A bench grinder is a very powerful tool. It grinds away the excess metal to create the tapered shape, but leaves significant scratches/scars in the surface. I have found that it is best to use 3 different bench grinders. I just happen to own them for other purposes over the years. I start with the coarsest, this removes the metal fastest, but leaves the surface looking very scratched. I work through medium to fine, each grindstone cuts less, but leaves the surface smoother. I them move to the work bench and finish the blades off by honing them on a series of flat stones. I work through a series of grades of grind stones starting with 60# and 200# grit carborundum oil stones. 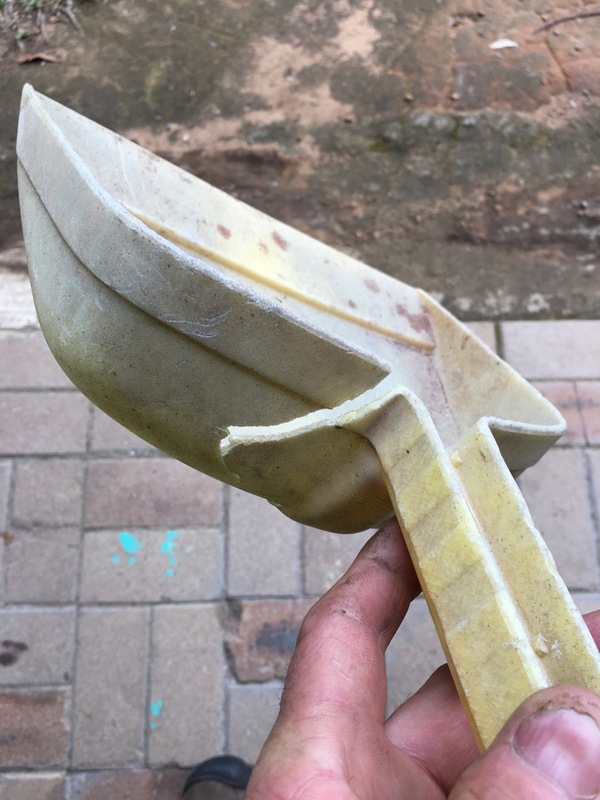 The purpose of these stones is to try to polish off the scratches that are embedded in the steel from the bench grinder, then moving on to 400# and 1000# water stones and finishing on an 8000# grit Japanese synthetic water stone that puts a very fine finish on the blades. This hand finishing is a labour of love. It takes ages to get a nice even surface and finishing with a very sharp edge without damaging that ultra fine edge. Always keeping it even. This is done entirely freehand without the use of jigs. I wouldn’t like to do this for a living, but it is very good to do it this once, because the reward is to re-purpose something that was once, only a few days ago, just a piece of rubbish. Now they are beautiful hand-made kitchen knives. The last step is to make a wooden handle for each blade. 30 years ago, when I built my kitchen, I kept the best off-cuts of cedar wood for making pottery tools, which I have been using to make my own tools ever since. This is very nice straight-grained timber. but is useless for anything else, as the pieces are so short. They just happen to be perfect for knife handles though. These small bits of wood also need to be carved and then polished using sand paper to get a nice smooth finish. I prefer working with wood, rather than metal. It’s a gentler and softer process. Cedar also smells very nice. The handles are finished with olive oil. I could use boiled linseed oil, but as they are kitchen knives, olive oil seemed more appropriate. Nothing is ever finished, nothing is perfect and nothing lasts. Although the quality of this steel means that they probably won’t need to revisit the water stones for a year or more. Steel like this can’t be sharpened using a butcher’s ‘steel’ to touch up the fine edge intermittently. This high-speed steel alloy is so hard, that it is harder than the butcher’s ‘steel’. These knives have to be ground on a stone the same way that I sharpen my Japanese knives. I have tried making a few different sizes and shapes. I don’t know which ones I will prefer to use yet. Maybe non of them will prove to be very good. I may have to go back and make some more. I’m still learning. I do have a few more worn-out hack saw blades left in my cupboard, so it is possible. I could just have been wasting my time this last couple of weeks, but even if they don’t prove to be useful to me or appropriate for purpose, I have really quite enjoyed the process of creating them. I’m pretty certain that a couple of them will be OK, but only using them will tell. Anyway, it beats working for a living. I’ll do anything to avoid getting a job!